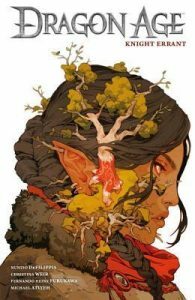 Dragon Age – Escape Reality, Read Fiction! 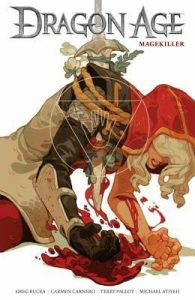 Journey to the world of Thedas in these canonical comics from BioWare and Dark Horse! Tessa and Marius are mercenary partners who eliminate those using magic to hurt others. When they betray a powerful patron intending to kill them, they're forced to flee and join the Inquisition. Later, they're taken captive during a mission and it's up to an unwitting agent to rescue them: elven squire Vaea, who's just arrived in Kirkwall for a lavish party thrown by Varric Tethras. A talented thief, Vaea takes on an easy side job . . . but when she chooses to change the terms of the deal mid-heist, she is entangled in this dangerous recovery mission that is surely above her pay grade. 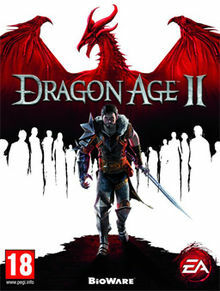 I just started a new play-through of the whole Dragon Age saga, which made this a perfect time to review this. The title is a rather unhelpful mouthful of not very informative. 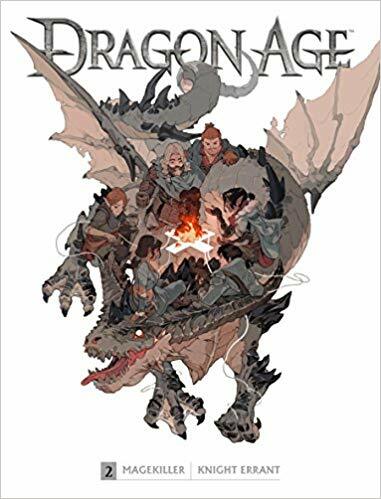 What this big little volume is is a hardcover compilation of two Dragon Age graphic stories, Magekiller and Knight Errant. I knew I was going to get to this eventually – I even picked up an eARC from Edelweiss. But in the end, I bowed to the inevitable and purchased the hardcover. While graphic novels CAN be read on my iPad, that doesn’t mean they SHOULD be read on my iPad – unless I’m really desperate and away from home. The hardcover is large and awkward – but fun reading at the table. They feel/read like short stories that just so happen to be illustrated. I’m not saying that the graphics aren’t terrific – because they are – but both of these stories would work equally well as short stories without the lovely, additional graphics. The stories are canonical – nothing in them conflicts with the game story canon. A fan can imagine them taking place around the edges of the game(s) actually played. These events happened while your Inquisitor was somewhere else being, as Varric Tethras might say, “all Inquisitorial”. The first story begins a bit before the game starts, with a pair of mercenary magekillers (hence the title) who have been coerced into killing known cult members before the cult manages to murder the Divine and kick off the whole thing. They find themselves working for the Inquisition, alongside many of the other side characters in the story. What’s fun about Magekiller is that the male/female mercenary partners are work partners without being romantic partners – nor is there a will they/won’t they vibe to the story. It was pretty neat that the romantic pairing in the story turns out to be between the female mercenary and one of the Inquisition’s better known spies. Who is also female. That the hero of Magekiller has a very similar vibe to one of my (and many people’s) favorite characters in Dragon Age II is icing on a surprisingly tasty cake. 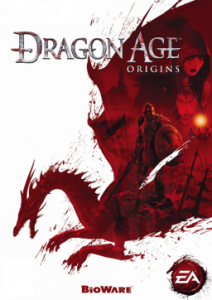 Knight Errant also feels like it has some callbacks to Dragon Age II, as well as to the game that started it all, Dragon Age Origins – which I’m playing again now. Varric writes fiction, but he also fictionalizes the heroic deeds of his friends – including himself as a secondary character. It’s a practice that causes him no end of trouble, and makes him an interesting but extremely unreliable narrator. In Knight Errant, Varric is a secondary character in someone else’s unreliable narration – and he’s more than willing to play along. But under this seemingly simple tale about a has-been knight who travels the world on the strength of the stories he tells about himself, there’s a lot to unpack about why we tell the stories we tell, and how much of ourselves we invest in those stories. And if you don’t finish this story hearing the original cast of Hamilton singing “Who lives, who dies, who tells your story” you weren’t paying attention. Escape Rating B: If you’re a fan, this collection is a lot of fun. Possibly even more fun than Hard in Hightown. There are a ton of in jokes scattered throughout both stories, and we get a chance to see a different bit of this world and different facets of characters we have come to know and love. There are also some informative annotations from the creators on the process of both the story and the graphics. While I can’t think that anyone else would be interested, for those of us who are working through our hundredth play-through of the series and trying to keep from chewing our nails waiting for Dragon Age 4 (which probably won’t be out until 2021 at the earliest!) it’s a fun way to pass some time in Thedas. 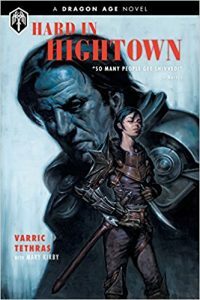 Prolific dwarven author and heroic companion of the Dragon Age games, Varric Tethras brings us the collected edition of his breakthrough crime-noir drama, Hard in Hightown (with help from his trusted human confidante, Mary Kirby)! This volume is beautifully illustrated by Stefano Martino, Alvaro Sarraseca, Andres Ponce, and Ricardo German Ponce Torres, with a painted cover by E.M. Gist! Twenty years of patrols have chiseled each and every stone of the Kirkwall streets into city guardsmen Donnen Brennokovic. Weary and weathered, Donnen is paired with a recruit so green he might as well have leaves growing out of his armor. When the mismatched pair discover a dead magistrate bleeding out on the flagstones, they're caught up in a clash between a shadowy organization known only as the Executors and a secretive group of Chantry agents--all over some ancient artifact. This is a prose novel featuring 24 black and white full page images. This book seems like it’s kind of a joke. Admittedly an in-joke for people who love the Dragon Age games, of which I am certainly one. But it also sorta/kinda isn’t a joke. Like many stories that are part of long-running series, it’s also a visit with old friends. Both of the slightly disguised and not-so-slightly disguised variety. After having a book epically fail this week, I needed something that was sort of a joke and definitely a visit with some old and dear friends. That this was the first thing I ordered sent to the new house that has arrived so far was kind of icing on the cake. It was meant to be. Hard in Hightown is one of his most popular. It’s also a lot of fun, mixing fairly standard genre tropes into what feels like a fully realized fantasy setting. It’s the story of a guardsman nearing retirement who falls headfirst into one last big case. A man with a reputation for breaking the rules in order to get things done, Donnen doggedly follows the sparse clues from person to person, place to place and ambush to ambush. The path takes him through punishment, betrayal and ultimately a reward that is better than money. Or at least he hopes it will be. And it’s the kind of tale that would easily fit into one of the old shared world series like Thieves’ World or Liavek. It also sounds like the kind of case, and in the kind of place, that Sam Vimes used to tackle in Ankh-Morpork before he married into the nobility. In other words, Hard in Hightown is a mystery set in a fantasy universe. Reading it brought back a lot of fond memories, both of the game and of the fantasy mysteries it strongly resembles. And it was a load of fun from beginning to end, at least for this fan. I’m not sure it would work for anyone who did not have at least a passing familiarity with Dragon Age, particularly Dragon Age II. Admittedly, I’m not sure why anyone who wasn’t already a fan would pick this up in the first place, except as a joke. But Varric was every bit as much fun a storyteller as he is as a character. Reading this made me nostalgic. I think another playthrough of the series is on my horizon – at least as soon as we dig out from the worst of the moving debris. Escape Rating B: I was looking for a palate-cleanser of a book, something to wash the taste of a complete failure out of my mouth. So I switched from a book that managed to make what should have been an exciting story into a dull recitation, and turned to a writer I knew could make falling down the stairs into an epic tale. And I’m glad I did. If you’re a fan, you’ll love it.